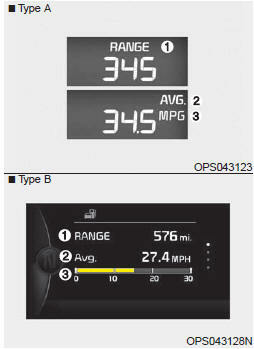 The range to empty is the estimated distance the vehicle can be driven with the remaining fuel. - Distance range : 30 ~ 1999 mi or 50 ~ 1999 km. If the estimated distance is below 30 mi. (50 km), the trip computer will display “---” as distance to empty. If the vehicle is not on level ground or the battery power has been interrupted, the distance to empty function may not operate correctly. The distance to empty may differ from the actual driving distance as it is an estimate of the available driving distance. The trip computer may not register additional fuel if less than 6 liters (1.6 gallons) of fuel are added to the vehicle. The fuel economy and distance to empty may vary significantly based on driving conditions, driving habits, and condition of the vehicle. The average fuel economy is calculated by the total driving distance and fuel consumption since the last average fuel economy reset. The average fuel economy can be reset both manually and automatically. To clear the average fuel economy manually, press the RESET/ button on the steering wheel for more than 1 second when the average fuel economy is displayed. To make the average fuel economy be reset automatically whenever refueling, select the “Auto Reset” mode in User Setting menu of the LCD display (Refer to “LCD Display”). Under “Auto Reset” mode, the average fuel economy will be cleared to zero (---) when the vehicle speed exceeds 1 km/h after refueling more than 1.6 gallons (6 liters). The average fuel economy is not displayed for more accurate calculation if the vehicle does not drive more than 10 seconds or 0.03 miles (50 meters) since the ignition switch or Engine Start/Stop button is turned to ON. This mode displays the instant fuel economy during the last few seconds when the vehicle speed is more than 6.2 MPH (10 km/h).